The #1 choice for all your concrete polishing needs. Our team of experts provide service in Los Angeles area, Orange County, Inland Empire and all of Southern California. We have a dedicated team of Industrial Concrete Polishing experts are here to help and work around your schedule to minimize downtime. When it comes to Office flooring, many options are available. Our Polished concrete flooring is designed to meet all the those requirements and offers countless combination of durability, scaleable pricing, quick maintenance and designs. Los Angeles Concrete Polishing will protect your floor with our top quality chemical resistant coating. Our polished floor is easy to clean, chemical resistant and can withstand the constant traffic flow a warehouse requires. Our vast collection of retail flooring solutions were made to make it easy to design your retail space so that it will be inviting for customers and encourage repeat visitation. Trust The Concrete Polishing Specialist Who Know It Best! Have Questions? We Are Here To Help! Just Contact Us! Concrete Polishing in Los Angeles is becoming the floor of choice among retail outlets to residential homeowners with the choice of a highly polished reflective floor to a semi-polished matte finish. Color and designs can be added to really showcase your polished concrete floor. With the low maintenance and ease of cleaning concrete polishing has become popular in most big box stores as well. 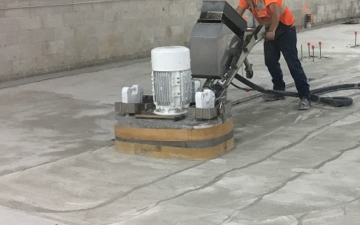 Concrete diamond-polishing technology has changed and Los Angeles Concrete Polishing has followed and researched the best possible tools, machines, and methods to deliver you the floor of the future. For over a decade, Los Angeles Concrete Polishing has provided complete care and service for all Concrete and natural Stone surfaces to homes and businesses throughout Los Angeles and Orange County. Using only true and proven methods, as well as the most cutting-edge and advanced commercial tools available. Here is the Process for polishing concrete: The concrete is sanded with several steps of diamond grits, usually, 2-8 depending on the gloss level desired. Los Angeles Concrete Polishing offers the Highest-Quality, Durable and Moisture Controlled Industrial Flooring. Saving money, while improving both appearance and workplace efficiency is your goal. We are here. Industrial floors should always be safe to allow firm footing for your employees on the floor. With our services, you can focus on your business, you will have peace of mind that your vigilance to safety has been met --and never have to worry about a dirty, hazardous concrete floor. Concrete polishing is the solution to your Warehouse Manager's concerns about floor conditions, and Los Angeles Concrete Polishing is the # 1 option in the L.A area for the best concrete polishing available in LA. Los Angeles Concrete Polishing is the top choice for best results within a firm budget. Los Angeles Concrete Polishing helps your Office, Loft-Space, or Commercial Space maintain its non-slip coating, and hold its durability throughout the life of the floor. Our services add veneer and shine to your floor space, and extends the "like-new" appearance for years. Using our long-established expertise, as the leading concrete polishing company in LA enhances the Longevity, Durability, and Aesthetic Value of your concrete floor - for the long-term. For your concrete-based retail floor polishing needs you will want the highest quality and cost-effective solution. Call us at Los Angeles Concrete Polishing! We are the best because we treat each client as if they were our FIRST client. We are cost-effective, the quality is top notch - explaining why we have been in business for so long. We lead the way and set the standard for retail concrete polishing in LA. Retail customers ARE your business. We will maintain the luster of your concrete floor throughout the constant foot traffic!Using Los Angeles Concrete Polishing as your Preferred Vendor for Retail Concrete Polishing in LA is a wise (and safe) decision, as we are long-established as the leading concrete polisher in LA. In retail - your flooring IS your integrity - Do not trust your integrity to amateurs or to a pop-up bargain-rate discount service - trust the experts. We are devoted to public/customer flooring and walking safety, and our products and service reflect that motto. In addition - aesthetically, our results can not be matched. We maintain the new Concrete Floor luster, gloss, that lets your customers know you care. Choose Los Angeles Concrete Polishing to protect your warehouse concrete floor polishing needs. We are long-established as the leading concrete polisher in LA. Protect your floor staff, forklift operators, and hard-hats. Our floor polishing services use chemical resistant coatings, easy to clean products, and enhanced moisture control systems. Trust the industry experts for concrete polishing in LA. Do not waste your time or budget with amateurs -we get it done right the first time and every time with minimal interference and disruption to your Warehouse and operations. From the Foreman to the Loaders, no one should have to worry about footing. There is too much work to do. Trusting Los Angeles Concrete Polishing is always the right choice to ensure optimal safety and concrete floor longevity. We are the proven leader for concrete polishing in LA - and our results will speak volumes. There are dozens of Concrete Polishing companies in the greater Los Angeles area - why choose Los Angeles Concrete Polishing? Simply put: We deliver the highest quality service, on time, within the allotted budget - and specifically tailored to your project. We EXCEED expectations. Polished concrete is a revolutionary method of revitalizing concrete. We can give that old grey concrete into a glossy, mirror-like finish. You don't have to spend extra money on floor cleaning materials. Los Angeles Concrete Polishing is the next generation on concrete polished flooring and offers the leading polished flooring services in L.A. Period. We can make your concrete look new again with polished concrete! We have a long-term reputation for excellence, let us show you why. Durable, cost-effective and low maintenance. We will transform your concrete floor into something extraordinary with polished concrete! Custom polished concrete polished just for you and your property. We make sure your concrete floors match the highest quality of service possible. No detail is too small, our team of experts ensures that their years of expert concrete knowledge is applied to every project we do. No matter what the situation, our team of concrete professionals holds a high integrity in the way we conduct business with our clients, as well your clients/customers/guests around them while completing their project. Los Angeles Concrete Polishing will evaluate and strategize the best solution services possible for what your upcoming project needs. We take in every factor when determining completion time such as any other construction going on in your location, your hours of operation, and strategize accordingly. We are very proud of our expert concrete employee's safety standards. Unlike other companies, we make sure to clean up our mess, leave no hazards that could injure clients/customers/guests in the process of completing our project. Our customer approach to Concrete Polishing is not only done we get the job finished but to provide a level of professionalism unparalleled by the quality of work. With our quality assurance guarantee, our clients can rest assured if anything goes wrong that we are there to help. Review the latest information about multiple topics that concern your concrete flooring. In our blog we offer a wide variety of topics anywhere from tips and tricks that can increase the longevity of your concrete flooring, to information about how we can add your company logo into your new flooring. Review the following information and remember, if you have any questions we are here to help. Simply just fill out our Get A Quote form to get started today, or simply contact us with your questions. There are normally ten to fifteen steps required in producing polished concrete floors with many grinding passes, although there are other ways to get a similar polished concrete appearance. Fred and his crew were great. I called them because I have a new construction garage and I wanted a modern finish on the floor. By far Fred was the best in explaining their process and why their product would be the best fit. They were in an out in a couple days and did a great job of cleaning up at the end of each day. The floor looks fantastic! Looks so good that I'm thinking of sending back the hardwood I purchased and having Fred come back to polish the rest of my house. Long story short...great company, great product. I'd highly recommend them! I used this company to polish my garage floor as part of a remodeling project. After interviewing a number of companies, I finally decided on LA Concrete. Overall, this company from start to finish did a fantastic job. The owner, Fred and his staff were always quick to respond to any questions I had, the workmanship was impeccable and they provided a very competitive bid. If you're looking to polish your concrete, do yourself a favor and use this company. You will not be disappointed. Our mission is to find exactly what our customer's needs are and then provide them scalable options. With our specialized consulting approach, our concrete polishing team helps identify what is important to the customer in order to deliver the best concrete polishing service possible. We understand that every industry is unique and with our long-standing industry career, we offer our quality assurance with every project in Los Angeles area, Orange County, Inland Empire and all of Southern California. Polished concrete flooring extends the duration of the floor life and removes the need to hide stains, dents or chips. Regularly polished floors have more overall longevity and do not harbor dust. Cost savings are immediate and long-term. Polished floors are easy to clean, requiring only occasional damp mopping. With concrete floors polished - there will always be less maintenance and longer service life. Los Angeles Concrete Polishing are your experts for Staining And Sealing. We prepare the Surface for new or old concrete. We apply the Decorative Stain after the concrete has been cleaned or ground. Then we apply the actual stain. Remove any remaining residue. Once the stain has been applied, cleanup is required. Using this optional service can give your concrete a number of color variations. Resin-based and seamless flooring materials provide greater durability and savings for commercial spaces. The main seamless resin materials are Epoxy, Polyurethane, Methyl methacrylate (MMA). Industrial and Commercial floors must withstand heavy loads and high impact/abrasion. Without proper industrial concrete floor systems, your surface will suffer. Non-polished concrete floors will crack and deteriorate over time. Los Angeles Concrete Polishing easily handles heavy duty epoxy flooring and coatings, to withstand the extreme pressure and constant heavy traffic. A Logo on polished concrete looks beautiful. Our platform is getting things right the first time for our clients. A stained logo is permanent and correct logo placement of course matters. At Los Angeles Concrete Polishing, when we get the logo in position, our experts measure everything to perfection. They always turn out amazing. We are trusted floor resurfacers who have been in business for over a decade in Los Angeles. We have the confidence and experience in dealing with all concrete floor problems whether residential, commercial or industrial. Whether it is your porch area or your office entrance, and even factory floor- we are the best choice for your repair or keeping your concrete maintained. Los Angeles Concrete Polishing is fast becoming the industry leader for residential concrete polishing in Los Angeles. Polished Concrete removes the need for throw rugs or chairs to hide stains, dents or chips. Polished concrete extends floor life and is easy to clean. Pristine and glossy concrete does NOT harbor dust, dirt, or allergens. Polished Concrete also comes in a variety of colors and designs. Floors in commercial kitchens undergo some of the harshest treatment. Call Los Angeles Concrete Polishing, for your trusted concrete floor polish vendor in LA. When installed in commercial kitchens, flooring is exposed to high temperatures and damage from corrosive chemicals. Frequent washing, exposure to hot oil, grease and moisture makes kitchen floors vulnerable to degradation and cracks. A commercial kitchen environment is one of the harshest any floor can meet. Los Angeles Concrete Polishing offers the best polishing system - seamless, sanitary, moisture and skid resistant. Urethane coatings are flexible and scratch-resistant, and great choices for warehouse floors and industrial complexes with large machinery. Polyurethane coatings are also soft on animal paws, so they are good choices for veterinary labs, and animal laboratory facilities. Since urethane coatings are so durable and glossy, they can make excellent showroom floors and even aircraft hangars. Epoxies boast a wide range of advantages that help to create a functional, hygienic and easy-to-maintain surface. Epoxy based systems have traditionally been the most popular form of resin flooring, due to the variety of colors and formulations available. Los Angeles Concrete Polishing uses Epoxies that offer a wide variety of color options and decorative effects, such as in seamless resin terrazzo systems. Preparing concrete surfaces for coatings, overlays, stains or repair is a laborious task that most contractors do not enjoy. The experts at Los Angeles Concrete Polishing know that floor preparation is an essential first step in the process. Winging it is not an option when it comes to floor preparation for concrete polish. We will take you through the entire process step by step. Concrete is a durable building material, but after years of usage, the damaged floor can degrade to the point where it needs to be replaced. Replacing a small floor yourself is tricky and can be very challenging for a non-expert contractor. At Los Angeles Concrete Polishing, we are the established industry leaders for every aspect of concrete floor polishing in LA. We will make floor removal as seamless and least disruptive as possible to your home. Our customer approach to Concrete Polishing is not only do we get the job finished but to provide a level of professionalism unparalleled by the quality of work that increases your conversion by making your retail store, hotel, office, or hospital more inviting for your clients/guests but it will ensure that they spend more time and money from their first impression in to their last. What this shows is that we don't just put ourselves in your shoes when while we are polishing your floors, we put ourselves in your clients/guests shoes so we can create the most captivating and engaging experience possible in order to yield maximum results on your business. Simply click GET A QUOTE, or head to the contact us page! We offer our Quality Assurance Checklist with every project! Why is concrete polishing the best option? Concrete polishing is the best option. Unlike tile and laminate flooring, polished concrete offers the greatest amount of protection vs traffic, chemicals, moisture and the wear and tear of daily use. It provides a non-slip surface area in which you can rest assured for the safety of your employees, vistors and guests. How much does polished concrete flooring cost? Because there are so many options, obsticles, and solutions specialed for your industry that we have dedicated polished concrete experts provide you a tailored specific solution. Our quotes are scalable as are the optional services. This will allow a bigger budget for the rest of your space. What types of styles are available for polished concrete floors? Aesthetically, polished concrete is the best modern choice to make as it takes your existing foundation and provides many options that can integrate into the design of your space. We offer a number of tints/color solutions as well logo integration into your personalized design. Polishing Concrete is one of the most cost-effective solutions, and provides more than enough protect with easy maintenance. Is maintenance of polished concrete difficult? Not at all. Polished floors are chemical resistant as well stain resistant. Simply just use a dust mop and or wet mop using a gentle clenaing product to maintain your shine and slip resistance. You may also want recommendations or help from our experts, which we are happy to provide. Where can we find someone to help install polished concrete floors? We can! Just fill our our quote here or call us at (877) 502-7483. We specialize in all types of concrete, including polished, decorative, overlays, and more. How slippery is polished concrete? Sleep soundly knowing that concrete polshied floors are slip resistance. What type of grinding/polishing equipment do you use? Concrete Polishing & Sealing employ different machines and various tools to complete the service in the most appropriate fashion in accordance with job requirements. The workhorses of our industrial production line are robust HTC-800 HD Classic floor grinders. They are extremely effective for industrial and commercial projects of 3,000 FT2 and up. We refine your existing concrete floor with a number of fine dimaond grinders until your concrete becomes smooth and shiny. Not much different that how wood is smoothed with different grains of sandpaper. Our floor has vinyl tile on it, can you remove that? We can, but you will probably save money by having your contractor, or demolitiion crew do it. In any case, you should test for asbestos, first. My concrete is very rough, so can it be polished? Absolutely Yes! Even rough concrete can be ground to a very smooth and finished polished floor. Not sure what your service you need? Los Angeles Concrete Polishing is here to help. Just simply fill out our quote form. Our team is comprised of fully trained experts who love what they do. They underwent the most rigorous training in the industry and proven themselves among the best of the competition. We complete our projects with extreme integrity. We understand completion time is a major factor, that is why we work around your schedule. All cost estimates factor in everything you need and are scalable. We’ll never make false promises just to get your business. We are meticulously professional and prepared for every project we work on. This includes showing up on time, being organized—and meeting deadlines and does our best to work around unforeseen complications. With our decade of experience in and around the Los Angeles and Orange County area, we use our past successes and a perpetual intention to better our game. Finally, we do the project right, from start to finish and beyond. This means we don’t just take risks—with your space or the people inside. We’re the absolute perfectionist for safety during the job and after. We make sure all of our customers are excited about their new concrete floors as much as we are. Trust Los Angeles California Concrete Polishing Specialists. Our expert team will assist with in choosing the right floor finish that will fit your project and budget. For over a decade, Los Angeles Concrete Polishing has provided complete care and service for all Concrete and natural Stone surfaces to homes and businesses throughout Los Angeles and Orange County. © 2018 Los Angeles Polished Concrete. All Rights Reserved. Prove your human, whats 1+1?